Be the first to share your favorite memory, photo or story of Benjamin "Ben". This memorial page is dedicated for family, friends and future generations to celebrate the life of their loved one. Benjamin “Ben” C. Phillips, son of the late George Thomas Phillips I and Arrie (McKilroy) Phillips, was born July 6, 1934, in Mount Ida, Arkansas, and passed away January 15, 2019, at his home in Norwood, Missouri. He was 84 years, 6 months, and 9 days of age. Ben’s family moved to California when he was very young. While living in California, Ben attended Cameron Creek Church. He also enjoyed playing semi-pro baseball. 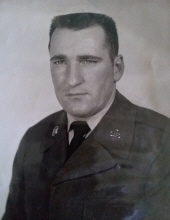 Ben joined the Air Force in 1954 and served as an Air Police Staff Sergeant Senior Airman Class E-5. He was also in the Air Force Honor and Color Guard and played football while serving his country. Ben married Ruby Helums in 1959. Two children were born to this union, George Thomas Phillips II “Tommy”, and Kimberly Susan Phillips. Ben moved to Norwood, Missouri, in 1977. He greatly enjoyed watching the students of Norwood School play ball throughout the years, especially basketball. Besides his parents, Ben was preceded in death by his wife, Ruby, on December 31, 1985, his sister, Alma McCoy, his brother, Joseph “Joe” Phillips, his sister, Mamie McCoy, and his brother, James “Jim” Phillips. He is survived by one son, George Thomas “Tommy” Phillips, II of Norwood, Missouri, one daughter, Kimberly S. Phillips of Nixa, Missouri, one sister, Allene Roesli of Visalia, California, one sister-in-law, Joyce Phillips of Visalia, California, one grandchild, Stephen L. Jolly, 28 nieces and nephews, and other relatives and friends. To send flowers or a remembrance gift to the family of Benjamin "Ben" C. Phillips, please visit our Tribute Store. "Email Address" would like to share the life celebration of Benjamin "Ben" C. Phillips. Click on the "link" to go to share a favorite memory or leave a condolence message for the family.